I just ordered new yarn for the first time in MONTHS, and I am so excited about it that I had to write a post! 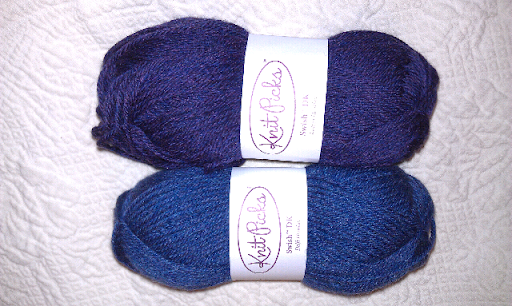 I noticed when I was shopping that the price of KnitPicks Palette increased from $1.99 to $3.39. I am sad because this is one of my all time favorite yarns, but it is still very affordable so I will continue to knit with it. But I decided to give myself a treat. There were some tote bag kits that each contained 14 balls of palette on sale for ONLY $25! 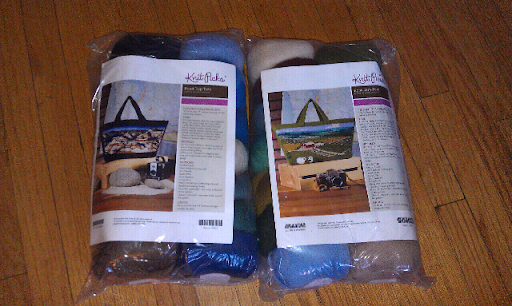 I don't plan on making the landscape bags, but I will certainly use these predominantly blue and green yarns for something fun. The last (and only) sweater that I made was completed when I was in high school, almost 10 years ago. I decided that it is time for me to make another sweater, and I wanted to get some samples of superwash merino wool to decide on the color for this project. (KnitPicks used to have color cards... that would have been much easier!) I think I'm going to go with the indigo color, as the blue is a little too blue jean for my taste. Now I have to make ANOTHER yarn order to finish up some projects for Christmas... and maybe for a few other presents for myself. Have you picked out a pattern? May I suggest cables? I do have a pattern in mind for the sweater. It is simple, but one I think I should be able to make the fit work. 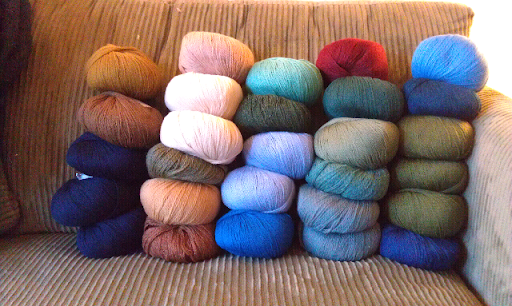 The reason I haven't been working on sweaters is that I'm afraid of my fluctuating weight, not the construction. I am still searching for the perfect sweater to make my husband, and that one will certainly have a lot of cables!